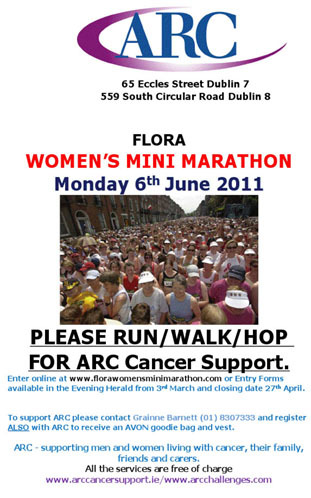 The Flora Women's Mini Marathon in Dublin is the biggest of all women's event of its kind in the world. It has grown steadily in numbers since it began in 1983 and over those years almost three quarters of a million women have entered the event. Last year the Women's Mini Marathon had a record entry of 40,397 on the Bank Holiday Monday in June. The event is unparalleled in its appeal. Women of all ages representing every county and every walk of life take part in this great festival of, and for, women. There is no pressure put on anyone - all the participants have to do is get fit enough to walk, jog or run the 10K. It is up to each individual to set her own target. Every finisher is a winner - and will receive a commemorative medal and ribbon to mark the achievement. Charities are the big winners from the Women's Mini Marathon and last year that almost €14m was raised by women for various charities. All charities benefit. The women decide themselves who they will support and many local causes gain vital revenue from the event. It is now the biggest single day charity event in the country. This year Soccer-Ireland.com is asking all soccer moms to run, walk, or hop the Women's Mini Marathon for ARC. Aftercare/Research and Counselling is a registered community based charity at 65 Eccles Street, Dublin 7 and 559 South Circular Road, Dublin 8. ARC supports men and women living with cancer, their family, friends and carers. All of their services are free of charge. There is hardly a family in the country that has not been touched by cancer and ARC provides vital support to cancer sufferers and their families. It is a truly worthy cause and deserves our support.